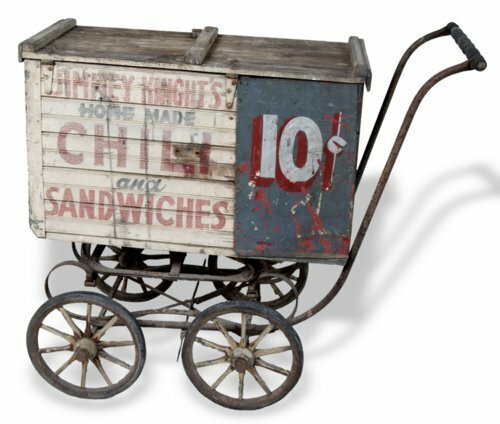 Jimmy Knight started his food service career in 1942 with this small lunch cart. Knight used this cart to sell food in downtown Topeka, especially near the Statehouse grounds. Knight served homemade chili and sandwiches from the cart. In 1943 he expanded his food service business and moved into a building at 717 Quincy Street, Topeka. The restaurant became known as Jimmy Knight's Café and the menu was expanded to include hamburgers and pastries. His son, Jerry Knight, donated the cart in 2002. The homemade cart is comprised of a wood box mounted on a baby buggy undercarriage. Creator: Knight, James E. "Jimmy"